Today I have a major lemming of mine that I was able to snag in a swap. I think it is one of the most gorgeous holo polishes out there... a-England St. George! Look at this stunner in the sun! 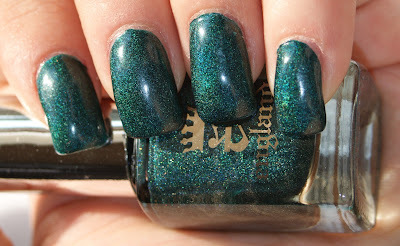 A-England St. George is a beautiful teal scattered holo polish. It applied like a dream and was not all that difficult to remove. It didn't stain my cuticles or anything, which is common of darker blues and greens. I was so excited to finally be able to rock St. George! Right now, over at a-England's website, you can snag any of the Mythical collection for $7.82 and free shipping! While that doesn't include St. George, it includes awesome holos like Tristam and Lady of the Lake! EXCITING! OMG I need this polish in my life!